The original Fort Witten was constructed in 1774 by Thomas Witten as a defensive structure during hostilities with Native Americans. A small militia was stationed at the fort during Lord Dunmore's War. The blockhouse style building contained two rooms, one upper and one lower, with the upper room being slightly larger than the base. During the 18th century, this type of fortification was frequently constructed in isolated areas where other means of defense did not exist. Loopholes, very narrow window slits, allowed defenders in the fort to fire upon anyone who attacked the building. There were several other such fortifications along the Clinch River, including Fort Maiden Springs, which was also located in what is now Tazewell County. In 1926, the Fort Maiden Springs chapter of the Daughters of the American Revolution set about constructing a replica of Fort Witten on a hillside near the building's original site. The dedication of the new fort on July 4, 1927 garnered incredible interest and it is estimated that 25,000 people attended the event. Over the course of the next 90 years, the fort served a variety of uses. For a time it was home to a craft guild that sold quilts and various other craft goods. The walls were covered with the names, initials, and dates of visitors to the fort. It became a local landmark that everyone recognized, and almost everyone has a story about visiting the site. 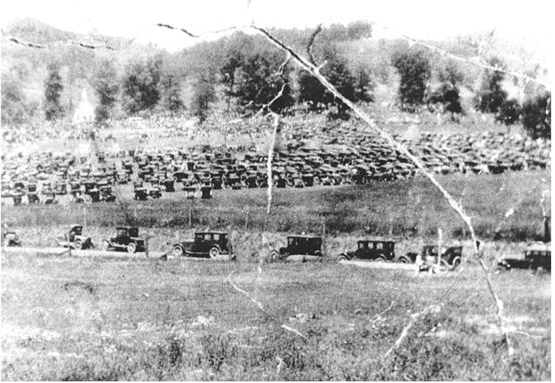 Fields filled with cars as people arrived to attend the dedication of Fort Witten, July 4, 1927. Pisgah Church can be seen in the back left portion of the photograph. 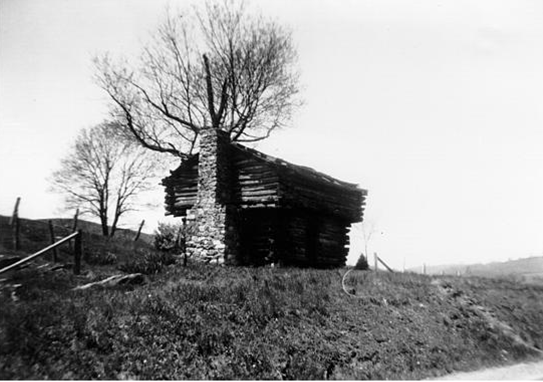 In 1926, the Fort Maiden Springs chapter of the Daughters of the American Revolution set about constructing a replica of Fort Witten on a hillside near the building's original site. The dedication of the new fort on July 4, 1927 garnered incredible interest and it is estimated that 25,000 people attended the event. Over the course of the next 90 years, the fort served a variety of uses. For a time it was home to a craft guild that sold quilts and various other craft goods. The walls were covered with the names, initials, and dates of visitors to the fort. It became a local landmark that everyone recognized, and almost everyone has a story about visiting the site. During the 1990s, Mr. Jeff Higginbotham donated the structure and adjacent land to the Historic Crab Orchard Museum, which is located next to the fort site. It has since been maintained by the museum as a display building, though it was not generally open for public visitation. Over the years, Fort Witten experienced wear and tear and began to be in need of significant repairs. In 2015, the Fort Maiden Springs chapter of the Daughters of the American Revolution once again stepped forward to help preserve this important piece of local history. Through the efforts of this local civic group, and with funds generously donated by the Ratcliffe Foundation, the fort was completely dismantled and reconstructed on its original 1927 site. Many of the original logs were able to be reused, with new logs added in where needed. The newly reconstructed Fort Witten was dedicated on July 4, 2017, exactly 90 years after the original dedication. The members of the Fort Maiden Springs chapter of the D.A.R. and Crab Orchard Museum continue to work together to plan for future and increased use of the fort. Improved accessibility and lighting, as well as a new memorial to the local men who fought in the Revolutionary War, will allow visitors to better understand Southwest Virginia's history through this important landmark.